PfC launches a new case study publication in the series "The Force of Example": "Independent culture and new collaborative practices in Croatia. 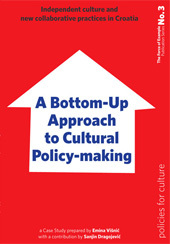 A bottom-up approach to cultural policy-making". This case study, edited by Emina Visnic, with a contribution by Sanjin Dragojevic, is the third of the publication series �The Force of Example� relating to Policies for Culture associated activities, projects and their follow-up throughout South East Europe. The case study was originally based on the action project CLUBTURE - Policy Forum: Towards a new position for the independent, non-profit and non-institutional cultural sector in the policy-making process, developed between July 2002 � January 2004. Both this action project and the present publication benefited from the support of the Policies for Culture programme, jointly developed by the European Cultural Foundation in Amsterdam and the ECUMEST Association in Bucharest. However, the current text covers a longer period than that of the project itself as it presents in some detail the various actions and phases of the advocacy process undertaken until 2007 by a wide coalition of independent cultural and youth sectors in Croatia. We hope this will give an accurate picture of best practice in the field of local cultural development in South East Europe. The book, published in English and Croatian, is distributed free of charge by ECUMEST, ECF and Clubture. A limited number of copies are available by contacting ECF.